what’s landfill but the backside of civility? 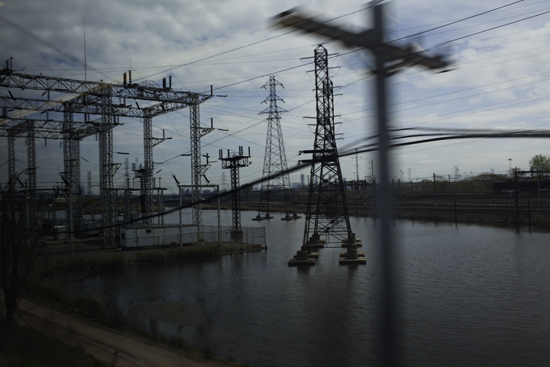 Viewable from the New Jersey Turnpike, from New Jersey Transit en route to Secaucus, from the parking lot of the Meadowlands Sports Complex in Bergen County, from the air approaching or departing Newark Airport, or up close, from one of its many trails, parks, or conservation sites, the more than 8,400 acres of largely undeveloped marshland along the Hackensack and Passaic rivers, which includes portions of thirteen New Jersey municipalities, is difficult to define. Perpetual meadow is the agricultural term for an expanse of grassy land that is neither wetland nor pasture and where the presence of water restricts the growth of woody plants and trees. Here tall grasses called phragmites (common reeds) thrive, as do asphodel, the stalky, green-white flowers that are sometimes the subject of poetry, but are more often regarded as weeds. 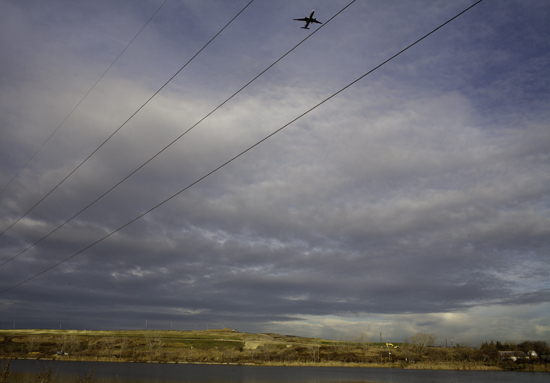 Daily, hundreds of commuters take in views of the Meadowlands. The scenes outside their windows are hardly picturesque: endless rows of power lines; withered tree stumps in brown-gray swamps; mile after mile of tall, obstinate reeds; a gloomy tour of the skylines of northeast New Jersey’s industrial cities. From the window of a passing train or car, it is easy to look out and see emptiness—a wasteland where perhaps a meadow once was. The PJP Landfill is one of the oldest in the Meadowlands. It collected trash from the time of horse-drawn wagons until, in the late 1960s and early ‘70s, it was leased and used for the dumping and burying of hazardous waste. Not long after, the drums of waste started leaking. Chemical fires and spontaneous combustions began occurring underground and continued for more than thirty years, emitting volatile gaseous contaminants all the while. Though the fires have since been extinguished, and many of the 5,000 drums removed, and the landfill capped and seeded in an attempt to restore the land, the hills remain equipped with a system of PVC piping, a means of continuous gas ventilation, and are surrounded by gravel-lined ditches designed to stop the spread of toxic runoff, or leachate, into groundwater. Tall fences prevent trespassers—James and me on this day—from exploring the alien surfaces. Still, these hills that once burned, as one PJP employee put it, “like Dante’s inferno,”appear greener and lusher than the fields of phragmites along the marsh. From a distance, it almost seems that these rolling green hills had always existed for the sole purpose of cultivating grass, not unlike a meadow. Closer up, they are more pathetic than off-putting. 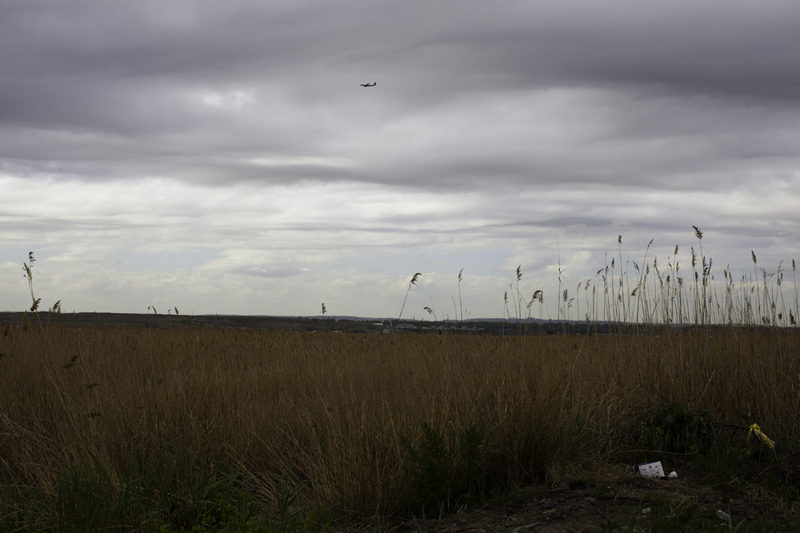 The Meadowlands are a place of contradictions. Decades of dredging and dumping have altered the Jersey marshland’s ecology, ridding it of forests and species of animal and plant; changing the courses of bodies of water. Today the Meadowlands are home to several active landfills as well as experiments in conserving those, like PJP, that have been closed. The Meadowlands are a sanctuary for migratory birds and a Superfund site. 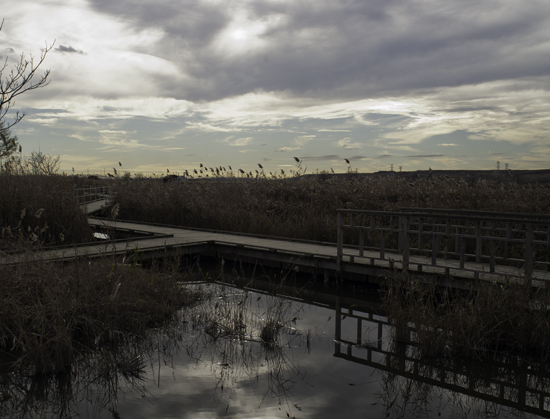 The New Jersey Meadowlands Commission has designated areas of the wetland for educational and recreational purposes, like hiking, canoeing, and kayaking. Despite talk of lingering contaminants, including dioxin (a compound used in many pesticides and herbicides, including—in the case of the Newark factory responsible for its leakage here—Agent Orange), some locals treat undeveloped portions of the Meadowlands like parks. They hike, swim, go fishing. The trail behind Gunnel Oval Park is an old railroad track. On either side, weeds, overgrown brush, and trees suggest a nature hike far from the city and the industrial sights of lower Manhattan. When I look beyond the brush, I am reminded of recent walks along the High Line in Manhattan’s Meatpacking District, where grasses and wildflowers are never far removed from the sounds and sights of city life and construction. To our left, just beyond the trees, Kearny Marsh, 400 acres of waterbird habitat, spreads out toward the Hackensack and the New Jersey and Manhattan skylines. Closer to where we stand, the marsh is dotted with debris—jettisoned shopping carts, old tires. Further on, an active landfill crawls with construction vehicles pushing garbage up the sides of slowly growing brown hills. On the other side of our path, just beyond the brush, high fencing protects a lot where gravel is dumped and sorted. The sound of gravel spilling on gravel seems natural, surprisingly familiar; the sound of hard rain hitting water. For many who have written about or documented the Meadowlands, it is these contradictions that inspire fascination. And we all seem to be searching for some sort of resolution, as if uncluttering our perceptions might unclutter the landscape as well. 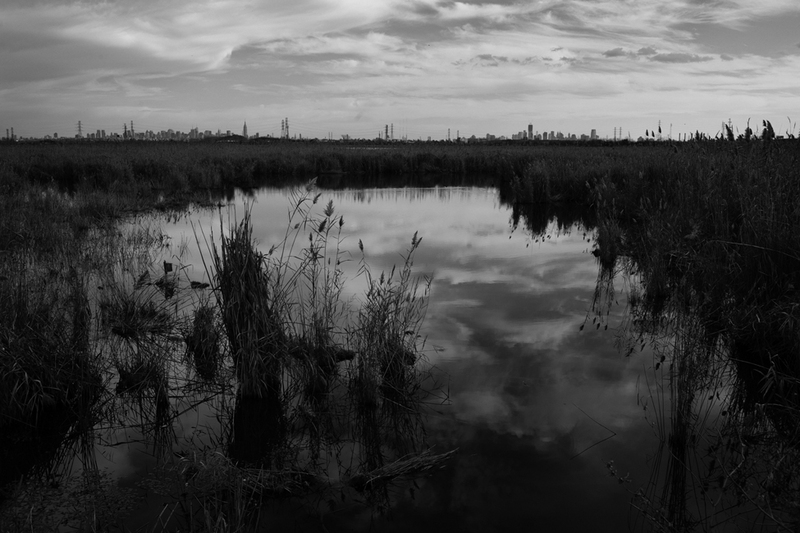 In his book, The Meadowlands: Wilderness Adventures on the Edge of a City, Robert Sullivan documents much of the disarray, but also lands on some satisfying resolutions. In order to describe the mostly “uninterrupted panorama” of the landscape, for example, he must also uncover an explanation for its tallest structures, the radio towers. He relates a conversation with a man who works the control station at the base of one these towers. The salt in the marsh, the engineer informs him, acts as a conductor for radio signals. Radio towers represent an altogether different type of industrial landscape than, say, the factories along the New Jersey Turnpike, or the Turnpike itself. Like the stalky reeds that grow at their base, the towers are suited to their environment. Though there have been complaints by nearby residents, who have come to resent the towers as eyesores, there is something congruous about their relationship with the land that supports their function—as if their being there is only natural. Kearny Marsh reminds James of a trip he took many years ago to the South of France. 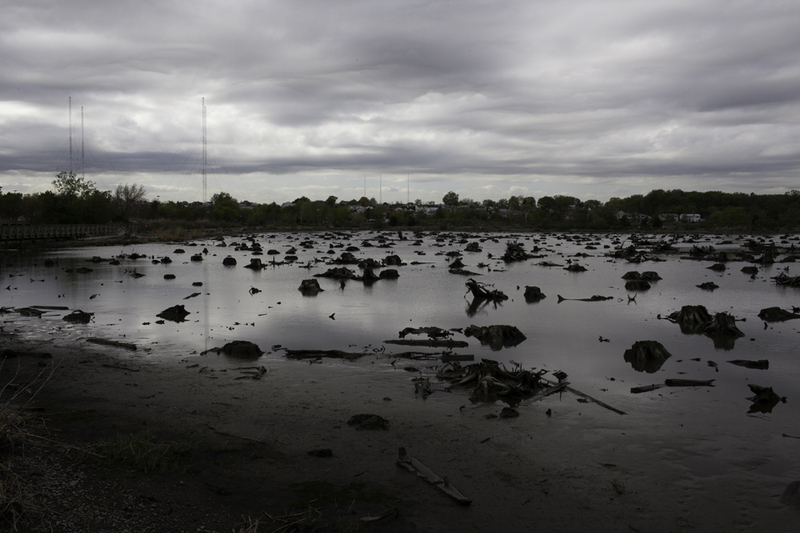 For a photographer, the Meadowlands present what he describes as “the Mediterranean problem.” On one side we have the Alps (in our case, mountainous landfills, industrial landscape), and on the other, the Mediterranean (Kearny Marsh, the Hackensack). 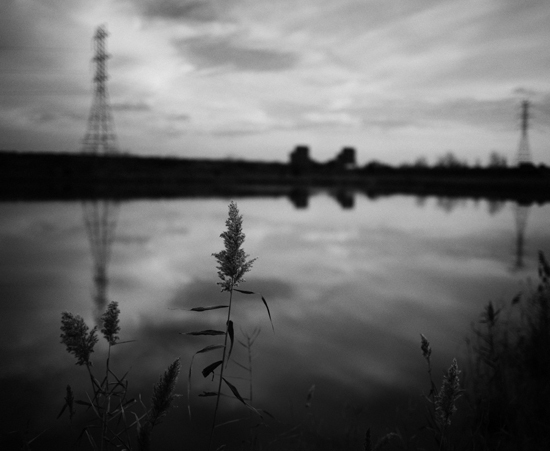 The challenge, then, was to compose a series of photographs that conveys both: river and skyline, habitats and trash piles, reedbeds and radio towers… It was not merely the train tracks or trees that complicated our view. 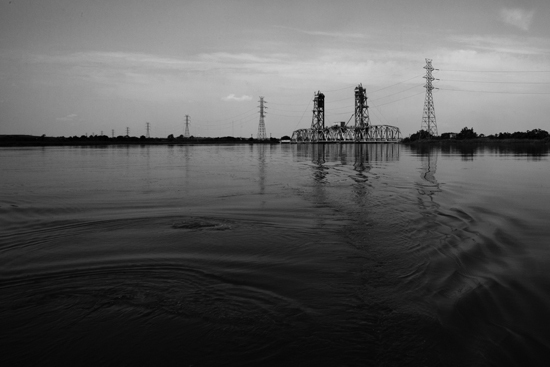 The distinct and yet inseparable sights of nature and industry that characterize a place like the Meadowlands are difficult to reconcile, and so also to capture. Just as the natural landscape has evolved to accommodate its industrial neighbors, industry has, in certain ways, been absorbed by the nature of the marsh. Our task was not to set one view against another, but to continually adjust our focus to see beyond one to the other, to illustrate the seemingly opposing aspects which nevertheless grow from, and thrive in, the same landscape. Perhaps as a result of all these contradictions, the Meadowlands can easily inspire expressions of mixed intention—as can be seen in both our use of the land and in the ways we represent it. Buried in the landfills and marshes are layers of our history, archaeologies of lives, and in some cases, mere leftovers. Rubble shipped from London during the Second World War mingles with tossed oyster shells from Manhattan dinner tables, remnants of the old Penn Station, and, purportedly, the bodies of victims not meant to be discovered. Today the Manhattan and Jersey City skylines stand in subtle contrast to the glassy rivers and grassy beds. The flat marsh attracting migratory birds is neighbor to an active landfill where seagulls come to feed. Near the corner of Ridge Road and Disposal Road, a labyrinthine dock snakes through the reeds, a park where visitors can observe the ecosystems below and above them, while just across the street service roads cut through overgrown fields, an abandoned ball park, and unmarked construction sites. From Kearny Marsh we move on to Richard W. DeKorte Park, where we are at last within reach of the waters of the Hackensack. As I contemplate the potential hazards of touching the water with my hand or foot, James crouches down to shoot close-ups of the reeds. 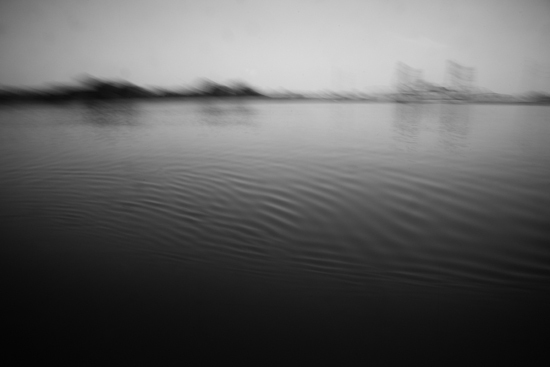 Later I would see the photos and note the towers mimicking the reeds; the reeds mimicking the towers; the water mirroring nature and industry without discrimination. Sitting now on the rocks that line the walkway by the river’s edge, I watch him as he gets closer to the ground, and more comfortable even, lying on his side among the reeds and asphodel, camera in hands, with nothing to support him but a bed of dried plant life. Robert Sullivan, The Meadowlands: Wilderness Adventures on the Edge of a City (New York: Doubleday, 1998), 146-147.